I recently found this blog called While I’m Waiting and on Wednesdays she does a link up where you can talk about what you’re “waiting on, going through, making, anything – as long as it’s family-friendly!” So I thought this week I’d link up and share what I’m waiting on. We are flying home for my cousin’s wedding Saturday. Sunday is going to be a super full day. I’m running the Rock n Roll Chicago Half Marathon, as well as going on a boat architecture tour with my parents, and then meeting up with some friends to kayak the Chicago River. So lots to look forward to! We will only be home for a few short days so we have to cram a lot in. Then my sister will be flying back with us to spend some time in sunny California. 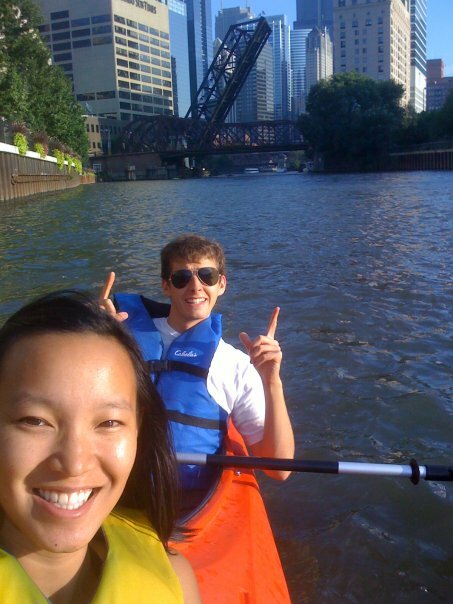 Here is a picture of Dave and I kayaking the Chicago River back in 2009. It’s been quite a while since we did this, so we’re both really looking forward to it! And my two best friends and their boyfriends are going to come with us. Nothing like time with your besties 🙂 I’ll try to take a few pictures to share. I’ll do my best to blog about the half marathon when we get back from our trip. I’ll share what works for me for training and I’ll be glad to answer any questions you may have, to the best of my ability. But trust me, I’m no running expert, I just know what has worked well for me in the past. I’m excited to read what other bloggers are up to on this link up. See you all soon! Safe travels! Excited to hear about your race. You are going to rock it. Yay for family and best friend time! Have so much fun! Thanks Kylie! I’ll be sure to blog about my half when I get back next week. Excited to follow your training and progress for your first FULL marathon, yay!!! What a fun filled weekend 🙂 Chicago is on my bucket list of cities to visit and I’ve actually never been kayaking- sounds like something else I need to add to that list! Have a ton of fun!! Yay! I adore this city, totally agree with you! it’s a gorgeous city and there’s so much to do and see! I love the MM it’s a gorgeous building and in such a great location! The river is beautiful, but definitely a little dirty! Last time we went kayaking my boyfriend’s shirt got stained from the water and it never came out! Ugh – so groady. I’ll always wait for the lake before jumping in, ha! That will be such a fun trip. And you will feel awesome knocking out that that too!!! I love Chicago! Good luck with your race! I’ve never been to Chicago, but I’d love to go one day! Honestly, there are sooo many cities in the US I want to visit! It’s pretty cool to think of how many amazing places there are here in the US. Even though I’m DYING to go to Europe! Have fun and good luck! I can totally relate to that feeling once it’s over! I’m so glad you found me and happy to have you linking up with Waiting on…Wednesday! I hope you had a fabulous time with family and friends! Thanks so much Holly! Link ups have been an awesome way for me to find blogging friends so thanks for hosting! !